I just got back from Natanis Point Campground on Maine Public Reserved Land on Chain of Ponds. OK- let me get a few things out of the way. It was so breezy there were no bugs. The fishing was incredible, and I swear the kids caught fish on bare hooks. The scenery was stunning. The wildlife was abundant. The canoeing was great, etc etc. Great place to camp for a reasonable price. I'd call it remote but I can't call it wilderness since they offer bathroom facilities with hot showers. We stayed for 4 nights and spent less than $100 including lots of worm purchases at the camp store. In any case, since we were camping with kids, I wanted to involve them with the cooking. Among other things, we had fresh bread every day, english muffins, corn bread, and chocolate cake. Most of the time I used a dutch oven. For bean hole beans, I use a cast iron bean pot with legs very similar to a dutch oven. For the corn bread we used the reflector oven. I really like the reflector oven with kids since they can actually see the food cooking. I bought mine from Don Merchant at Pole and Paddle. 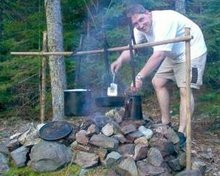 If you have access to sheet aluminum or stainless steel, Gil Gilpatrick's Building Outdoor Gear has a pattern and detailed instructions for making your own reflector oven. I'm sure I'll talk about some other projects in Gil's book, but the book is worth the $13 price just for the reflector oven pattern. We used a cast iron cornbread mold that made little cornbreads that look like ears of corn. The cast iron pan in the reflector oven made up for the fact that we fed the fire little twigs to keep the flames up. A reflector oven cooks with heat from your fire, but it works best with flames instead of coals. The cast iron pan holds the heat to allow for even cooking. We only had to turn the pan once. I really like the fact that Don's reflector oven design features a flip up top so I didn't have to work over the fire, or move the reflector oven once I placed it in front of the fire. In any case, we used the same fire to finish up the beans, start coals for a chocolate cake, cook our cornbread, and for the kids to cook hotdogs on. It seems complicated, but it wasn't. The kids and the adults enjoyed the food. I think we all gained weight on this trip.